This gorgeous arrangement overflows with white roses, alstroemerias, freesias, green hydrangeas, eucalyptus and fresh foliage. It is delivered in a classic white ceramic vase. Should a flower or foliage pictured be unavailable, our expert florists will substitute a replacement of similar style and of equal or greater value. The arrangement you order will be the same shape and size regardless. To make your flower gift more special you can also add a gift of delicious Handcrafted Truffles manufactured exclusively for Fiorence Atelier Floral. Handcrafted Truffles box 250 gr. Handcrafted Truffles box 450 gr. Delightful Handcrafted Truffles 450 gr. Exclusive product to add to the purchase of a floral arrangement, not for individual sale. Capello "Beauty And The Beast"
Like the one in our favorite fairy tale, this beautiful Capello includes one of our finest red roses in a bed of moss and surrounded by curly willow. Vibrant design featuring bright sunflowers, tangerine ranunculus, Green hydrangeas, alstroemerias, Queen Anne´s Lace and fine greenery in a classic white glass vase. Bright design featuring 100 hundred roses in soft hues of tangerine, yellow and pink with accents of green hydrangeas in a silver blown glass vase. Stylish and delicate piece featuring pink roses and chrysanthemums, green hydrangeas, wax flower and fresh eucalyptus in a French style white ceramic vase. Colorful and warm mix of golden sunflowers, orange roses, yellow and fucsia daisies, pink carnations and fresh greens in a wooden vase. Lavender flowers including roses, China aster, lisianthus, hydrangeas, Iris and amaranthus mixed perfectly and masterly placed in a glass vase lined with aspidistra leaves. Spectacular arrangement of lilies and our finest greens in a deluxe black cylinder. 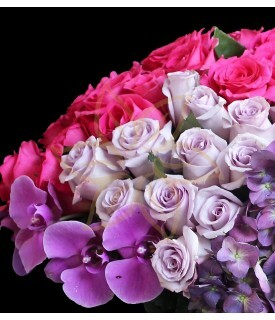 Spectacularly gorgeous and artistically arranged, this bouquet features 200 roses in a range of pinks and lavenders. It will surely take her breath away! Lovely bouquet of orange roses, hot pink and orange daisies, spray orange roses, Queen Ann´s lace and eucalyptus. Perfect to celebrate a best friend´s birthday! Stunning bouquet featuring orange roses, purple lisianthus, safflowers, fresh eucalyptus and exotic leaves for a dramatic touch. 24 PREMIUM roses perfectly placed in a Fiorence gift box. A beautiful Fiorence gift box with a dozen Premium roses. Roses available in red, white, light pink, bright pink and orange. A beautiful Fiorence gift box with a dozen Premium roses complemented with delicious handcrafted brandy truffles. Stunning luxury white lilies arrangement masterly crafted in an elegant ceramic vase. Our finest tulips arranged in a beautiful design with ten tulips, ornamental cabbage and fine foliage. Available in different colors. Stunning arrangement featuring 24 hot pink roses perfectly framed with fresh foliage crafted in a glass vase. Gorgeous design in shades of pink featuring lilies, roses, alstroemerias and the finest foliage gathered into a glass cube. Lilac roses mixed with pink chrysanthemums, spay pink roses, statice flower and our finest greens in a French Style ceramic vase. Ten beautiful red Tulips arranged in a clear glass vase. Available in different colors. Beautiful and bright arrangement with a wonderful variety of blooms including sunflowers, roses, alstroemerias, daisies, solidago and viburnum mixed with fresh greens. One of our best sellers, this woven box filled with red roses, hypericum and fine foliage, a beautiful gift for those who want to send a special treat. Exquisit cymbidium orchids in a Fiorence gift box. This unique bouquet will create a dazzlling display of unmatched elegance. A lovely hand-tied bouquet featuring a dozen soft pink roses, pink spray carnations, lilac statice flowers, green hydrangeas and fine foliage arranged in an original Fiorence Atelier Structure. Stunning hand-tied bouquet featuring a dozen pink roses, pink spray carnations, fucsia daisies, amaranthus green hydrangeas and lush greenery arranged in an original Fiorence Atelier Structure. Gorgeous hand-tied bouquet featuring a dozen pink roses, pink matsumoto asters, fucsia daisies mixed with green hydrangeas, eucalyptus, English lace and fresh greenery arranged in an original Fiorence Atelier Structure. Stunning hand-tied bouquet featuring purple lisianthus, trachelium, spray roses, carthamus and green hydrangeas arranged in an original Fiorence Atelier Structure. Lush bouquet featuring a dozen long stemmed Premium red roses, red daisies, fresh hypericum and fine greenery arranged in an original Fiorence Atelier Structure. Cheerful hand-tied bouquet featuring ten sunflowers, yellow alstroemerias, trachelium, green hydrangeas, statice flowers and fine greenery artfully arranged in an original Fiorence Atelier Structure. A dozen gorgeous Premium roses complemented with a bottle of Möet Chandon will be an excellent gift for a special occasion.